Shakespeare & Co. Booksellers: Roll them bones! 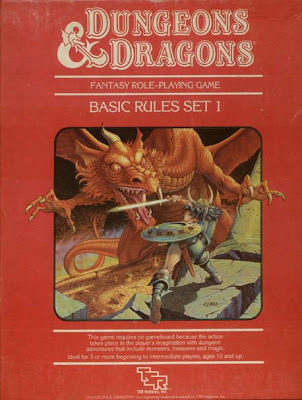 Roleplaying books are different than other kinds of books. I mean, really different. I think about it sometimes-- they defy any attempt to link them into another class. There is a strong argument to be made for the roleplaying game as the pinacle of post-modernism, of the exploded novel. Talk about open to interpretation! The roleplaying book will give you the setting, & will give you metatextual ways of resolving narrative, but even sample adventures-- the more narratively laden example-- are devoid of anything you could call a traditional story. The tools for storytelling is taken out of the text & put into the hands of the reader. Readers become the characters, even the narrators of the tale. Wild stuff, & a valid lens to look at the gaming material. They are like technical manuals, too. I mean, what is in a game book besides reference material? You refer back to it to see how the dice model the technical aspects of a fight, or what rules adjudicate spell casting. This slides into the page-by-page analysis: given how many times you read a page of a RPG book, they really are a spectacular value. Consider that you read a novel once, or maybe even re-read it a few times, then compare it with how many times you'll look at the entry for "elf," or the mechanics of "polymorph." The only other type of book that you go back to that often is a quality text book! Certain segments of the book become more valuable to you at different times-- your Ventrue vampire is going to get a lot more milage out of the rules for Dominate, while your Gangrel will use Protean's crunch. I can't for the life of me think of anything else like them. & gosh, I didn't even mention the art. I mean, how many artists got their start here, in gaming books? How many flourish in their pages? Art books are a niche market for a lot of buyers, besides children's books &, well, gaming books. Which brings us again to the Role-playing Game as a genre buster. I don't know if I buy this, to me they just seem like reference books. Albeit ones you really really like. But they are reference books...FOR NARRATIVE. Like the meta-text of playscripts, but...without any script. I couldn't agree more. I've been on this train forever, even before my return to actually gaming myself--although given that I was writing a lot of games then that I never played, I secretly always wondered if this was a real thing or I was just trying to make myself feel like I wasn't wasting my time. But the RPG as narrative scrapbook with the label "some assembly required" is one of the genre's more compelling and unique traits I think. Right? People talk about multiple narrative threads-- people even give props to Choose Your Own Adventure, but ANY core book is filled with INFINITE stories! Have you heard about the 4th ed Red Box yet? Yeah, I'm not impressed? But that is part of what I mean, like-- they used to make Monster Manuals that were in three ring binders so you could mix & match to suit encounters; how smart is that?